Aside from the cooking method, the marinade (and later, glaze) that's featured here is so flavorful, and only takes a few ingredients. 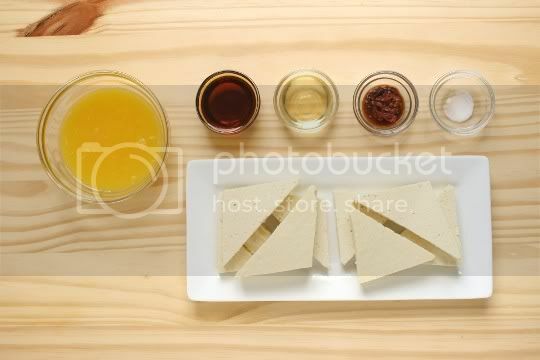 Orange juice, maple syrup, rice vinegar, chipotle peppers (and their accompanying adobo sauce), salt, and oil (not pictured) are whisked together to create both the tofu marinade and the finishing sauce. I marinated my tofu in the mixture overnight, but about four hours should be good enough for flavor absorption. When the tofu is ready, grab a roasting pan or a big piece of foil (this would probably also be great grilled!). If you're using foil, fold up the egdes so the marinade doesn't leak out during cooking. Broil for about 10-15 minutes on each side (the first side will take longer), until you start seeing blackened edges. Rotate the pan if necessary to achieve even browning. In the meantime, heat up the remaining marinade in a small pan. The mixture will be too thin to use as a sauce, so add a mixture of cornstarch (about 2 teaspoons) and water (about 1 tablespoon) and bring it to a simmer, stirring constantly. 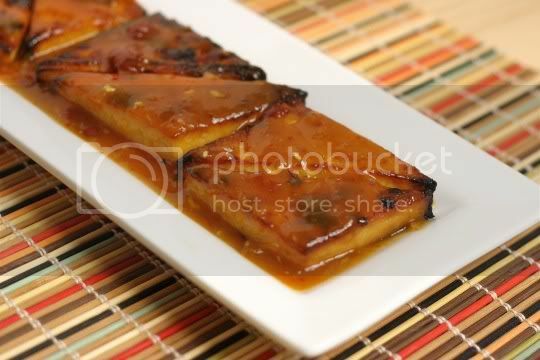 The mixture will start to thicken, creating a nice sticky-sweet sauce for the tofu. The end result is absolutely wonderful. The flavors are BOLD and will definitely waken your palate and sinuses. The sauce is sweet and super spicy, so you may want to halve the chipotle amount if you're not a fan of heat. There's also a bit of tanginess from the orange. 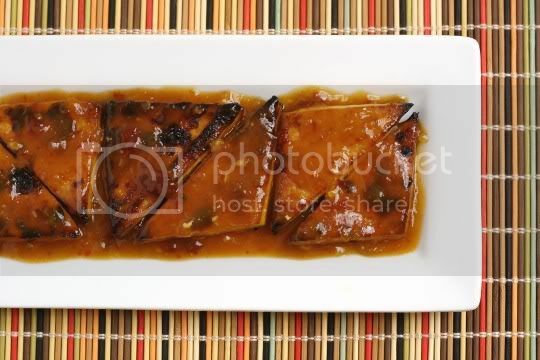 The tofu is firm, juicy, and chewy, with wonderfully burnt caramelized edges (marinating and broiling is the bee's knees! ), giving each bite an almost candy-like flavor. 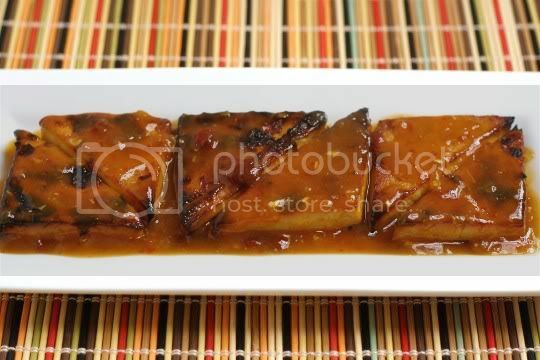 For some reason, the tofu also has a slight buttery undertone, making this an unbelievably decadent-tasting dish! Make again? Hell yeah. This recipe has standardized my future tofu cooking methods, and the sauce is a surefire winner! I'd love to try this with tempeh, seitan, and all the faux meats. This looks sooooooo killer! The crispy edges and the sweet sauce, yum! This looks AMAZING. I'm a sucker for anything chipotle. Love the placemat! Where did you find it? Found 'em at Bed Bath and Beyond, like $2 each! I just saw this post through Foodgawker. I love my tofu, but I always seem to undercook it or not marinate it long enough. Beautiful photos, I'm looking forward to trying this.